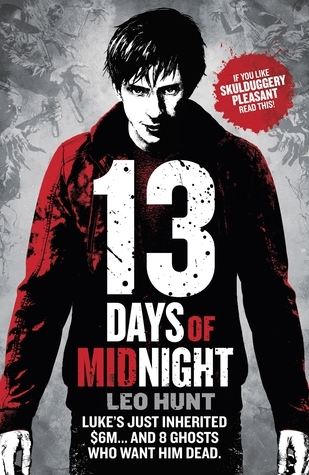 Presenting 13 Days of Midnight by Leo Hunt. An ok read, is how I would sum '13 Days of Midnight'. going by the gritty cover, the synopsis, the much hype and the many positive reviews this book had been getting, I expected maybe a bit too much. The plot wasn't that bad and the premise is very intriguing too but at most it felt like a cheesy been-there-done-that Halloween read.The characters took their time but only after first of the chapters did I start to appreciate them more. Not much about the humans but the 8 hosts, the ghosts Luke inherits after his father's death, definitely brought out the creep factor of the book. They are all separate entities. They have their own minds and they have their own quirks.And Luke as their next master is definitely a no no. Like Night and Day, subservient, ambitious, sneaky, raging like fire, with sharp canines and so on. So I liked that they brought real tension to the plot. The writing wasn't anything Phenomenal but rather than too to the point for my taste. Also the use of the first person 'I' throughout the first few chapters was rather annoying too but it changed when the plot began to take shape, so I didn't mind it later. While the author put in a valiant effort, it only scores a 3 stars from me. I liked the story but I didn't stick with me. "A perfect Halloween read but not the best"